New customers want a water dispenser for their offices that looks great and not just dispense hot and ice cold water. 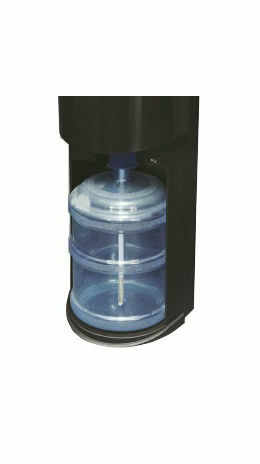 With a water dispenser bottom loading, they will get a dispenser that keeps its water store below the dispensing point. This allows for a taller, slimmer design and keeps the nozzle higher up on the unit than with top load units. Many customers prefer the bottom loading feature because it doesn’t require stooping down low to reach the lever and there is no need to lift up a heavy bottle , which is wat old designs of free standing units need (even table top). Often, bottom loading type is chosen for an office dispenser type because it is simply more comfortable for people to use. And with the many modern designs that these dispensers come in, it is easy to find one that goes well with contemporary office related decor. There are stainless steel model products that look like the appliances that are located in many offices. One of these dispensers looks great in a break room because of the modern styling and clean lines.Our company factory has a series of filter purifier system that will produce reverse osmosis drinking water and be supplied in 5 gallon bottled water together with the dispenser. With a water dispenser bottom loading product , it is easy to keep the water concealed away from view inside the bottom part of the unit. That makes the dispenser look like any other office machine, and it fits in seamlessly in any room in the office. Many customers will be interested in buying a dispenser that will add well into any room and that looks great no matter where you put it. This type of dispenser is often preferred for offices that want their clients to see a modern sensibility and who also want to supply easy cool hydration to everyone in the office. You do not have to search for other brands as Agies Resources Sdn Bhd is one of the few supplier that actually sell bottom loading machines. Our company does both sale , service and parts and accessories . Call us now to inquire about other product details , price list and to buy .